Five months after the release of Samsung's 850 Pro SSD, here's the one we've been waiting for: the 850 EVO. 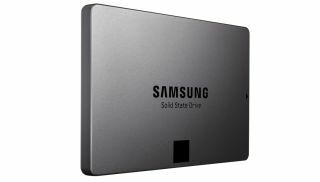 Back in July Samsung released the 850 Pro, the successor to the 840 SSD series. Samsung's Pro SSDs are fast, but on the expensive side. The 840 EVO, on the other hand, is known for being one of the most affordable SSDs money can buy, and it's still fast. The 850 EVO aims to fill that same niche, priced at $100 for 120GB, $150 for 250GB, $270 for 500GB, and $500 for 1TB. That's a bit more expensive than the 840 EVO is currently priced, but the 850 EVO will likely sell below MSRP. As of this writing, the 840 EVO is $132 for 256GB and $209 for 500GB on Amazon, for example. Like the 850 Pro, the 850 EVO uses 3D vertical NAND memory, which stores 32 cells atop one another to increase data density and performance. According to Samsung, the 850 Pro can output sustained reads of 540 MB/s and writes of 520 MB/s. That's inching close to the SATA 3 interface's 600 MB/s limitation. A few other changes Samsung notes compared to the 840 EVO: improved random write speeds in the smaller SSDs using TurboWrite, a new 5 year (as opposed to 3 year) warranty, and an upgraded Rapid Mode in its Magician software. Rapid Mode uses a RAM cache to speed up SSD performance. In some initial benchmarks with an 850 EVO Samsung sent us, we noticed some odd performance numbers with Rapid Mode enabled that may be the result of a software issue. We've got more tests to run to fully evaluate the 850 EVO. With Rapid Mode disabled, however, we saw normal results in a CrystalDiskMark performance test: sequential read speeds of 510 MB/s, and sequential writes of 493 MB/s. We'll have a full review, with benchmark comparisons to the 840 EVO, 850 Pro, and other SSDs, up soon.